Anne Brontë was born in Thornton, Yorkshire. 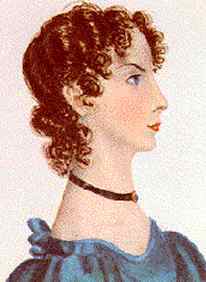 She was the youngest of six children of Patrick and Maria Brontë, and educated largely at home. After the death of her mother in 1821, and two other children, Maria and Elizabeth, Anne was left with her sisters and brother to the care of their father. Inspired by a box of 12 wooden soldiers, the children wove tales and legends associated with remote Africa. Emily and Anne created their own Gondal saga, and Charlotte and Branwell recorded their stories in minute notebooks. Anne's most effective education was at the Haworth parsonage, in which Mr. Brontë settled the year before his wife's death. In 1839, she worked for a short period as a governess to the Inghams at Blake Hall and later in same position to the Robinsons at Thorpe Green Hall near York from 1840 to 1845. Her brother Branwell joined her there as a tutor to Edmund, the only boy in the family, in 1843. He fell unfortunately in love for Mrs. Robinson - or annoyed their employers for some other reason - and Anne had to leave the position. Thorpe Green appeared later as Horton Lodge in her novel Agnes Grey. This sacking was a heavy blow to Anne's ambitions. She had enjoyed her life outside Haworth and she had a good reason to feel disappointed and bitter. Branwell drank himself into physical decline and died suddenly in September 1848 - Anne's novel The Tenant of Wildfell Hall, in which one of the central characters is an alcoholic, appeared in the same year. In 1846 Anne Brontë published a collection of poems with her sisters, Poems By Currer, Ellis And Acton Bell. Her first novel, Agnes Grey, a story about the life of a governess, appeared in 1847. It was based on Anne's recollections of her experience with the children of the Ingham family and the Robinson family. The novel did not gain similar success as Emily's Wuthering Heights and Charlotte's Jane Eyre. Her second novel, The Tenant of Wildfell Hall, was published in 1848 in three volumes and sold well. Some critics considered the frank depiction of alcoholism and the protagonist’s struggle to free herself inappropriate subjects for a woman, and Charlotte, in her "Preface" to the 1850 edition of Wuthering Heights and Agnes Grey, wrote of Anne's second novel: "The choice of subject was an entire mistake." Anne Brontë fell ill with tuberculosis soon after the appearance of the book. She died May, 1849, at the age of twenty-nine, and was buried at Scarborough. Agnes, an inexperienced, poor young woman, is governess to Matilda, a spoiled girl who feels it is her right to hurt people. She falls in love with Mr. Weston, a cleric, who she eventually marries. Largely auto-biographical. Helen Graham leaves her alcoholic husband and comes to inhabit Wildfell Hall, only to become the subject of gossip.